The Ball Game is a fun isometric puzzle game that is best played against your friends (or foes). Gameplay is a unique blend of checkers, scrabble, and the Japanese game of Go, with many creative twists. You control one of the four elements (air, earth, fire, and water), and can either walk (i.e. move to an adjacent square), or jump (i.e. move to a spot 2 squares away). Walking allows you to create a ball of your own color on the previous square you occupied, while jumping allows you to change the color of the opponent's balls (if any) in every adjacent square to your own color. Points are awarded for each ball you have, and the number of points you get also depends on the color of the square. You can also teleport -- always to a random unoccupied location on the board -- by selecting the location you are standing on. You will be teleported out of the board entirely if all spaces are occupied. The goal in The Ball Game is to be the player with the most points when all the players have teleported out (i.e. there are no empty squares left). Since different squares reward a different number of points, the fun is to plan your moves so that you can create or capture balls on cream-colored squares which award the most points. 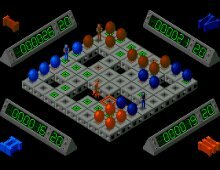 The player with the greatest number of balls therefore isn't necessarily the winner, and the limited number of teleports and its randomness adds an exciting random element to the game. This is a game best played with friends, as the computer AI is none too bright and will often teleport out even though it could still capture your balls. Unique concept, charming graphics, and great gameplay makes this a winner. Two thumbs up!